The AppCompat support library enables the use of the ActionBar and Material Design specific implementations such as Toolbar for older devices down to Android v2.1. 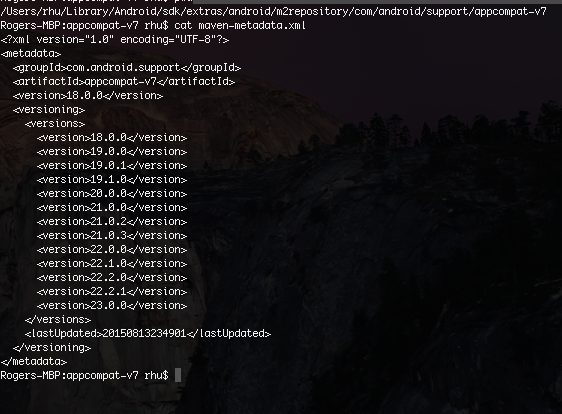 Note that the AppCompat library has an implicit dependency on the support-v4 library. The support-v4 declaration however does not necessarily need to be declared. Since the release of the support-v4 version 24.2.0, the library has been divided into separate modules: support-compat, support-core-utils, support-core-ui, support-media-compat, and support-fragment. However, because the AppCompat library usually depends on support-fragment, which still contains a dependency to all the other modules, you currently cannot take advantage of this change to reduce the number of overall dependencies. Also notice that once you upgrade to AppCompat v7 v24, you will also be forced to update your Build Tools and compileSDKVersion to API 24 too. There is a current bug that precludes you from compiling to lower versions. Once you are using this API version 23 or higher, be aware that the Apache HTTP Client library has been removed. Workarounds are discussed in this guide. Remove the Build Tools 23 from the SDK Manager. Find the appcompat-v7 SDK folder and delete the entire 23.0.0.0 folder. Clean the project and rebuild. Older projects may not include this library, so migrating requires changing the theme references and many of the main imports described in this blog post. Because the support class declarations are not compatible with the standard Android ones, you need to make sure you are using the imports from the support library entirely. Otherwise your app is likely to crash. The simplest is often to do a search-and-replace to start changing the following statements to start using the support libraries. Your AlertDialogs should import from the AppCompat support library instead, which takes advantage of the new Material Design theme. If you see AppCompat does not support the current theme features, it's likely the windowNoTitle setting has not been set or is set to false. There is more strict enforcement on what this value must be set on newer AppCompat libraries. See this Stack Overflow article for more context. For your menu/ layout files, add an app: namespace . For menu items, the showAsAction must be from the app namespace instead of android namespace. It is considered a custom attribute of the support library and will no otherwise be processed correctly without making this change. If you are using widgets such as the SearchView, you must also use android.support.v7.widget.SearchView instead of android.widget.SearchView. Note that the app namespace must also be used. Preferences need to migrate to start using compat counterparts. Preference xmls need to migrate to using android.support.v7.preference package counterparts, e.g. android.support.v7.preference.PreferenceCategory instead of PreferenceCategory and android.support.v7.preference.SwitchPreferenceCompat instead of SwitchPreference. PreferenceManager used in APIs like PreferenceManager.getDefaultSharedPreferences(context) should now be android.support.v7.preference.PreferenceManager. If you have a custom UI for your ListPreference dialog, it needs to break down into android.support.v7.preference.ListPreference and android.support.v7.preference.ListPreferenceDialogFragmentCompat. APIs like onPrepareDialogBuilder(AlertDialog.Builder builder) and onDialogClosed(boolean positiveResult) can now be found in the dialog fragment instead of the ListPreference itself. In addition, setting the targetSdkVersion to the latest SDK version ensures that the AppCompat library will attempt to apply the Material Design assuming the device itself can support it. The support library will still check to see if the minimum SDK version is being used on the device. The AppCompat library has issues with Samsung v4.2.2 devices. See this issue for more details.